« The Elements of Pragmatic Programming Style. Approach. When Pair Programming is the most effective method? The most important factor is match of skills and challenges. In Solo Programming the most productive mode is Flow when skills and challenges are matched. Pair Programming adds one more effective mode – Coaching that increases overall team productivity for the present and future tasks. 2. Coaching – expert programmer have experience and knowledge for solving the problem and shares it with other programmer, who cannot effectively solve problem alone. This more junior programmer has fundamentals to understand the solution and implementation. He learns and grows to become better programmer. 5. Two experts for a manageable task – pair programming doesn’t have much benefits if both programmers know how to implement the task and successfully solved similar problems before. 6. One programmer is in Flow, other is Learning – it is difficult to stay in Flow if other programmer frequently interrupts and needs many explanation for basic things that are not directly related to challenging problem. 7. One programmer is in Flow, other is Coaching – to make this mode successful for the growth, the coach should be open minded, avoid directing too much and should give opportunity for another programmer to come up with own (maybe even better) solutions. Prefer to work alone – an introvert programmer likes to work alone (loner). Can we make Pair Programming always effective? Yes! Match tasks, skills and pairs. 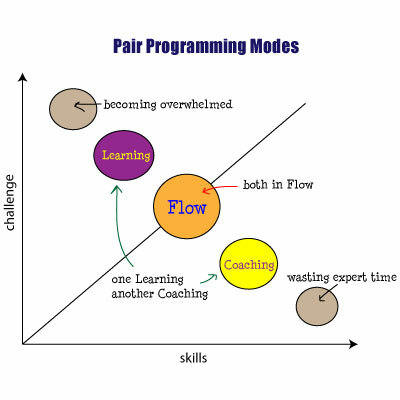 Try to find pairs for 2 productive modes – Flow and Coaching. A team will be most productive if the programmers pair solves together interesting problems matching their skills and learn from each other. However, Pair Programming should be a free choice and preferred method, but it should not be a forced mandatory practice. As you can see from this post, there are some modes and psychological situations when Pair Programming is not working well. In short, Pair Programming is one of the most useful tools in arsenal of the software team. Know when and how to use it. I think this is an excellent idea when the couple are sailing in same boat.